The OSS is forged from the toughest 8A stainless steel which allows this knife to cut though the toughest of materials. The 8 1/4" blade offers huge cutting power and is ideal at slicing or achieving deep cuts. The needle sharp tip allows this knife to piece though thick material and offers a good reach overall. The hand guard prevents your fingers slipping toward the razor-sharp blade and causing potential injury. Crafted from Kray-Ex the 5 1/8" handle provides excellent grip allowing full control and precision cuts to be made. The curved shape makes it fit virtually any hand comfortably. 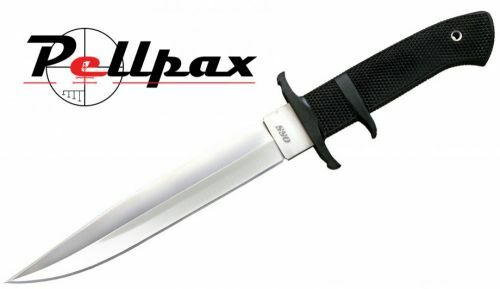 Finally to cover this blade when not in use and protect it from wear or stop it causing damage to you/others around you a Secure-Ex sheath is included. This also allows you to transport you knife around without compromising access to your handy tool. Add this item to your basket & spend an extra £393.01 to apply for finance.